So much for Easter plans..
As is usually characteristic for April, one or two big blows come through as the weather begins to creep up into the double digits. This year it sort of struck at the most inopportune time: Easter break. I was in Vancouver for the Friday windstorm that damaged a bunch of property on Vancouver island. It was howling through the streets on downtown Vancouver bringing with it large amounts of rain. I spent the day looking over the top of my book only to find the coffee on my table. Saturday was a bit more calm, so I travelled home, just to find another massive downpour waiting out in the north part of Haro strait. 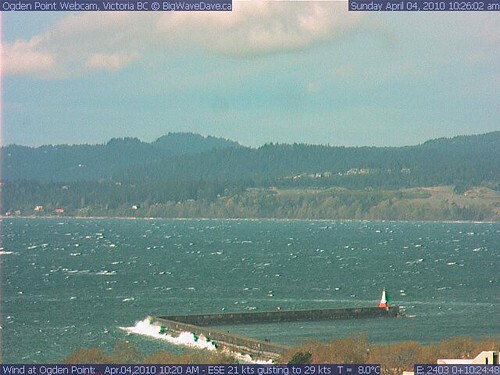 Today, Sunday, I woke up again to the sounds of windows rattling and webcam images from Big Wave Dave that got me wondering if renting a windsurfing rig for april might be a good plan next year. With kayaking, there's just days it's better not to find out what mother nature is made of. At least it's bright out - I think I'll take the bike out for a spin instead.